Let’s get one thing straight. 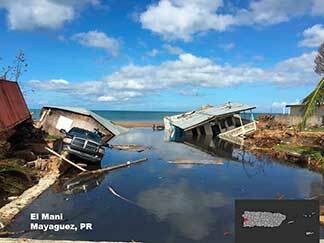 You have heard a lot about the Paris Climate Accord, which, in brief, was a global agreement that the world would work in concert to limit the rise in global temperature to 2°C by 2100.
Credit: Hurricane Maria damage in Puerto Rico. Photo Credit: National Weather Service. But a report released in October 2018 by the Intergovernmental Panel on Climate Change (IPCC), a body of the United Nations, warns that the 2°C goal set by the Paris Agreement is too high and we must limit temperature increase to 1.5°C to avoid catastrophic and irreversible damage to our environment. IPCC scientists warn that we have just over a decade to limit global warming to no higher than a 1.5°C increase above average pre-industrial temperatures. Without immediate action, we will likely surpass 1.5°C of warming, and will suffer higher—and irreversible— risks to both our human and natural systems. To put the seriousness of this in even greater context, the world has already warmed by 1°C since pre-industrial times, leaving a slim margin of 0.5°C before we hit our global limit. More common and intense severe droughts and extremely hot days, fueling forest fires and heat-related deaths (think California Camp Fire). More frequent flooding from extreme precipitation, sea level rise, and storm events, exposing communities to water contamination, illness, drowning, and mental health impacts (think Hurricanes Maria and Harvey). Decline in marine fisheries of 3 million tons (In 2017, commercial fishermen in Rhode Island landed 38,000 tons of fish- the expected decline in fisheries is nearly 80 times this amount). Disappearance of up to 99% of corals (Coral reefs are home to more than 25% of the world’s marine species, and generate $375 billion annually in economic value). To be clear, all of these risks will still exist if we limit our warming to 1.5°C, but—and it’s a big qualifier—at a significantly lower level. So, Rhode Island, it’s time to take the high road. To reach dry ground. To take an ethical stand. 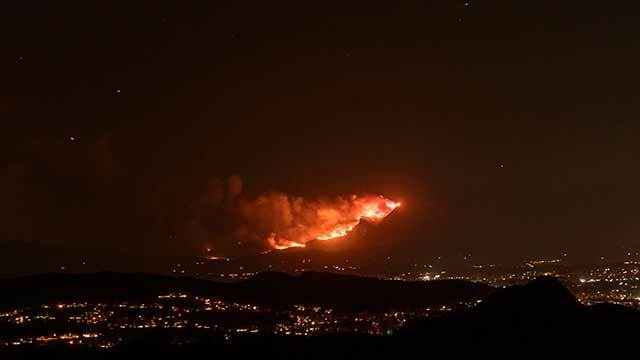 The Woolsey Fire burns a hillside in Los Angeles County, California in November, 2018. The 2018 wildfire season was California’s most destructive and deadly ever. Photo Credit: Shutterstock. 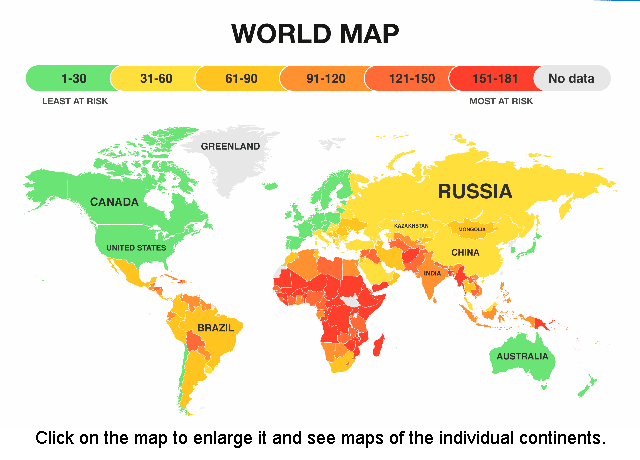 This map from The Eco Experts shows which countries are most at risk from climate change. Climate change and global warming are here. This double-barreled phenomenon has and will continue to have impacts on your everyday life - some good, some bad, some unpredictable. But climate change and global warming have indeed arrived. Whether you are among those most likely to be affected - a climate scientist, environmentalist, public health worker, developer, insurance adjuster, ark builder or just your average man or woman on the street - you will be affected. In fact, you are realizing the impacts at this moment, never mind those your children will experience. But the process can sneak up on you. It’s like gaining those first few ounces that turn into pounds. 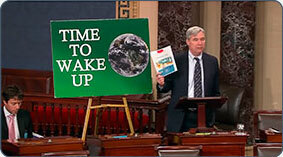 So let’s be clear: this is not a call for future generations to be on the alert and see how these activities play out. Climate change and global warming are with us right now, and it is time for people to start learning about them and taking action. Temperatures are getting higher, storms are getting more severe in every season, and it is not your parents’ environment anymore. “Blue About Sea Level Rise” - The face of Providence could be dramatically altered by rising sea level in the 21st century. The goal of the Climate Change Collaborative is to help us all become better educated about the ups-and-downs that the years ahead hold for us, our families and our communities as the planet and its inhabitants evolve and adapt to this shifting scenario. Now “adapt” may sound like we’ll just to buy a bigger pair of pants to accommodate those extra climate pounds. It’s not quite that simple. Just as extra pounds can increase the risk of diabetes or heart disease, raise your blood pressure and shorten your lifespan, climate change can put some added risks in your life. And the corporate trick of increasing that 34” waistline to 38” and still calling the pants a 34 doesn’t change the reality. Book Review: Jessica Lamond: "An urgent treatise on rising sea levels predicts a wild and watery future." Science magazine. October, 2017. The materials and information on this Climate Change Collaborative web site can not only point out what you may expect to see in your backyard, regionally, and around the world, but provides steps you can take — personally and/or professionally — to successfully cope with the challenges ahead, all the while explaining how they occur. C’mon, get the jump on the ounces before they become pounds. Nobody — no country, for that matter — wants to be “the biggest loser” when it comes to climate change. The Paris Climate Agreement is an international agreement brokered by the United Nations Framework Convention on Climate Change (UNFCC) to limit global warming to 2°C above pre-industrial levels. In December of 2015, the agreement was signed in Paris by 187 countries (counting the EU), with a small number of remaining holdouts signing since then. The terms of the agreement are not legally binding, and allow each country to determine its own pledge to reduce greenhouse gas emissions. Scientists warn that even if these goals are successfully reached, global warming will still reach 2.7° to 3°C above the pre-industrial average. In addition, the agreement established a goal to raise $100 billion annually from developed countries to fund climate adaptation and green energy strategies in developing countries. The United States was among the original signatories to the Paris Agreement in 2015, but withdrew its support in June 2017. Syria signed the agreement in November 2017, leaving the United States as the only UN country not in support of the global pact. 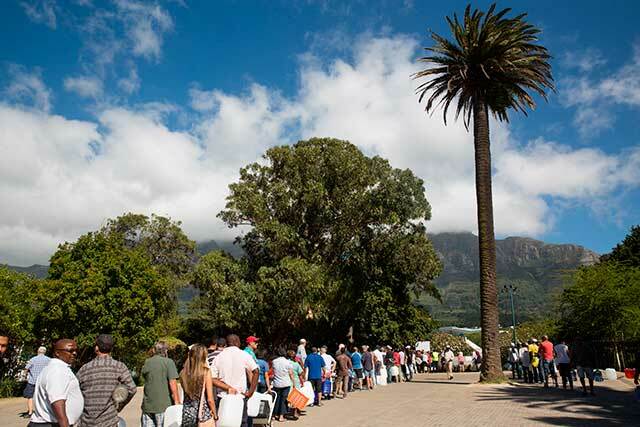 People wait in line to collect water during the worst drought in over a century in Cape Town, South Africa. In 2018, the city came precipitously close to reaching “day zero,” when public water supplies would be shut off, and water would be rationed to 6.5 gallons per person, each day. Photo Credit: Shutterstock. In an interview with NPR, climate expert Dr. Katharine Hayhoe explains how climate change influences extreme weather, including extreme cold and snow. NPR. The major scientific agencies of the United States — including NASA and NOAA — agree that climate change is occurring and that humans are contributing to it. Many places have experienced changes in rainfall resulting in more intense rain, as well as more frequent and severe heat waves. The planet’s oceans and glaciers have also experienced changes: oceans are warming and becoming more acidic, ice caps are melting, and sea levels are rising. All of these changes are evidence that our world is getting warmer.